Approximately 25 x 36cm. 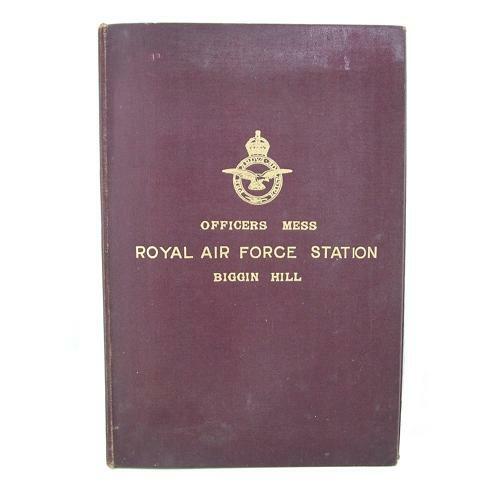 Manufactured from buckram covered card with gold embossed king's crown RAF crest and wording ' OFFICERS MESS, ROYAL AIR FORCE STATION, BIGGIN HILL' on the front. There is a thread running up the inner side of the spine that could be used to hold documents, a magazine or menu etc. The inside covers have period adverts for businesses local to the RAF base. One of these features a Gloster Meteor, Britain's only operational wartime jet fighter. The binder is in good condition. It shows wear and use with some soiling but has no significant issues. Biggin Hill was a highly significant fighter station during the war and critical to the course of the Battle of Britain. Whilst this is clearly later than that it could date from late war or the late 1940s. An excellent and scarce display piece. Stock code P22867.